Saving the world is a tough gig. Not only do you usually have to travel far and wide, collecting magic trinkets and companions, you also have to do it while dodging ever-more-menacing monsters. Saving the day is even trickier in Golden Sun: Dark Dawn (DS), however, because in addition to the other challenges you must face, you have to listen to the citizens of Weyard's endless yammering. Everyone, it seems, has an opinion about you, your mission, and your parents, and they are damn sure going to share it with you. At length. The game picks up 30 years after the adventures of your parents in the first two games of the series. Whether they saved the world or ruined it is still a subject of much debate as you and your magic-wielding Adept pals venture forth to take on your own epic quest. Strange vortexes have begun to appear across the land, sucking up the elemental energy known as psynergy and threatening the kind of chaos and destruction that heroes such as yourself were born to fight. Your adventure will take you from one city to the next, where you'll have to perform some Dreadfully Important Task - which inevitably includes besting many monsters in battle - before being able to move on to the next location. The format is well-worn, but also well suited to Dark Dawn's portable status; nobody wants to spend half their commute accidentally trekking off in the wrong direction. Dark Dawn is chock full of standard RPG gear like maces, boots, and swords, but the real star of the show are the djinn, magical creatures that help you tap into your psynergy, the magical energy that permeates the world. Some djinn will join you willingly, but you'll have to beat others in a fight before they agree to tag along. Each djinn specializes not only in a particular element, but also a certain kind of magic. One water djinn might provide healing spells while another bolsters offensive abilities; adepts favor a particular element - your character is in tune with Earth magic - but can mix and match their equipped djinn to access spells outside their specialty. Adding a particular kind of djinn might grant you new spells but remove others, and djinn must be distributed as evenly as possible amongst your party. It's an ingenious system that allows for a great deal of customization but forces to you give a little to get a little. The real fun of collecting djinn is using them in fights to summon enormous creatures that can do truly absurd amount of damage. One single earth djinn might be able to make a decent dent in an enemy, but two combined can summon Ramses, three can summon Gaia, and so forth - the more djinn you use to summon a creature, the more powerful that creature is. As with equipping djinn, this power comes with a cost - djinn must be in "standby" mode before they can summon anything, which effectively puts them on the sidelines, unable to do anything other than watch. Catching all those djinn will require a bit of dedication on your part. Though some pretty much fall into your lap, most require at least a bit of psynergy-flinging to solve the environmental puzzles that stand between you and them. As satisfying as nabbing the magical creatures is, it does take much of the risk out of the combat. Assuming you put any effort at all into collecting djinn, you'll be pretty overpowered pretty quickly, coming out of battles with little more than a scraped knee. The cash you amass from ignoring or selling healing items means you can outfit your crew with the best gear at every new town you encounter with very little extraneous grinding. The relative toothlessness of the fighting would be more palatable if the bits in between were less aggravating. RPGs with a lot of story are a good thing, but Dark Dawn doesn't have a lot of story so much as it has a lot of different ways of telling the same story. You and your party have to go collect a special gem from a nearby cave system - ok, no problem, let's go! The gem grants special powers. Yes, got it, move out! The powers of the gem are important. You'll need them to continue on your way. And so on, and so on, and so on. No subject is too small to discuss at great length and in great detail - so great, in fact, that the game has a built-in encyclopedia. If the writing was better, then perhaps the excessive exposition wouldn't be tiresome, but as it stands, I've contemplated calling down Ragnarok on more than one NPC I've met. 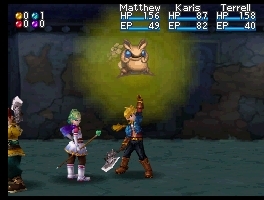 Bottom Line: Golden Sun: Dark Dawn has plenty of great spells, enjoyable environmental puzzles, and enemies whose heads desperately need caving in. The magical djinn are its only remarkable feature, but unfortunately turn the combat into child's play. Dark Dawn is a perfectly serviceable JRPG, and fans of the two previous Golden Sun titles will undoubtedly enjoy it. But it could be far, far better. Recommendation: If you're looking for a cheerful, brightly colored portable JRPG, Dark Dawn fits the bill. It's not particularly memorable, but it certainly has its charms.